New, New and More New! Taking place Week 1 (June 5 – 9) is Five Days…Five Challenges Day Camp. This camp takes place from 9 AM- 4 PM and is for students in grades 6-8. Week 2 (June 12 – 16) has Become an Artematician! in the morning for students in grades 4-6. Are you ready to sing? Girls in grades 6-8 can Take the Mic from 1 PM- 4 PM during Week 3 (June 19 – 23). Students in grades 2-4 can explore nature with Plant Yourself in the Garden from 9 AM - 12 PM during Week 4 (June 26 – 30). Our last week of classes and camps-- Week 5 (July 10 – 14) has lots to offer from building to animals to the Science of Superheroes Day Camp. This all day camp is for grades 4-7 from 9 AM - 4 PM. Students in grades K-2 will get to Color Your World in the afternoon. Like I said, that’s just a few of the new adventures we have happening this summer. 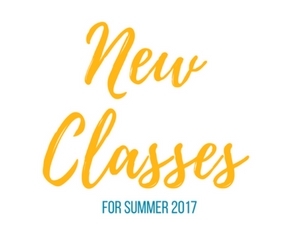 View the complete list of new classes. And see our entire class schedule with full descriptions. Download our Class Wishlist Worksheet, note your student’s favorites and get set for registration to open on Saturday, April 1 at 8 AM at BrightLights.org!